What’s in the First Brunei-Myanmar Navy Vessel Visit? A look at the wider significance of the defense interaction for the relationship. Last week, a Brunei naval vessel arrived in Myanmar for what was officially characterized as the first visit of its kind between the two sides. The development highlighted the defense aspect of the relationship between both countries amid wider domestic and international developments. Myanmar and Brunei, two fellow Southeast Asian states, established diplomatic ties in 1993. But the development of security ties has not factored as much as the other realms of the relationship thus far, be it economic linkages or the furthering of people-to-people exchanges. Both countries have looked to continue boosting the relationship over the past few years, with Myanmar going through its own complex reform process, which is ongoing, and Brunei trying to address a range of domestic political and economic challenges. That has been in the case thus far in 2019 as well amid wider developments, including those tied to the commemoration of the 35th national day of Brunei Darussalam and 25th anniversary of the establishment of diplomatic relations between Brunei Darussalam and Myanmar. Last week, the defense aspect of the relationship was in the headlines again with the first-ever visit of a Brunei naval vessel to Myanmar. 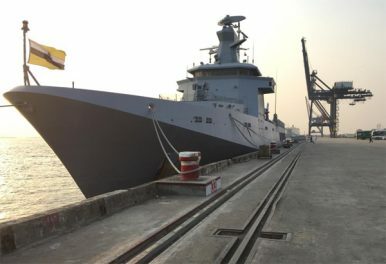 The KDB Daruttaqwa was in Myanmar for a goodwill visit to the country in what Brunei’s defense ministry (MINDEF) characterized as the Royal Brunei Navy’s “first official visit” to Myanmar. The visit itself consisted of a series of interactions. Following the Daruttaqwa’s arrival at Thilawa Port, there was a welcoming ceremony held with Myanmar officials and personnel present, a ship tour onboard, and courtesy calls between both sides that featured individuals including the mayor of Yangon and the commander of the Ayeyarwady Naval Region Command, Min Thein Tint. Though this is just a single interaction between the two sides, it is not without significance. It ought to be viewed as part of broader trends, be it the development of the defense aspect of the Brunei-Myanmar relationship or the wider effort by the RBN to increase its maritime presence in the region more generally, which we have been seeing in other countries in the Asia-Pacific as well. Following the Myanmar stop, the KDB Daruttaqwa continued on as part of its wider trip in the region, including a stop in Malaysia amid this year’s iteration of the Langkawi International Maritime Aerospace Exhibition (LIMA), one of the leading events of its kind in the region. What’s in the Brunei Military Chief’s Maritime Voyage?Brunei’s Military Gets a New Air Force ChiefChallenges Ahead for Brunei’s Military as It Marks 57 YearsWhat’s Behind Brunei’s New Defense Budget Hike?What’s Behind Brunei’s New Military Budget?